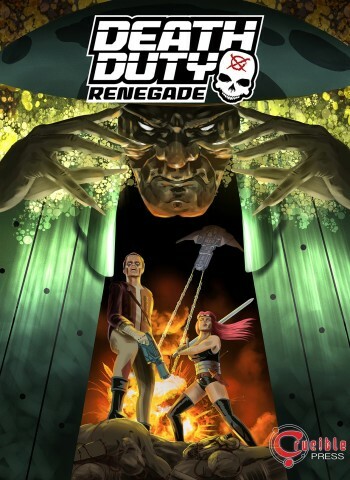 The complete Death Duty: Renegade, an all-action SF adventure comic by John Freeman, Dave Hailwood, Brett Burbridge and Ken Reynolds. Edited by Dave Hailwood, the Death Duty: Renegade collection is published by Crucible Press, a new comic imprint established by the team behind the comics web site downthetubes.net, in partnership with Biomekazoik. In a war-torn future, crime and disloyalty to the Terran Empire are punished with conscription into mercenary law enforcement squads: soldiers consigned to do or die in order to prove their commitment to the common good. Those who serve out a full year are entitled to a bonus and financial rewards for their work – and even the opportunity of early amnesty. Of course, very few survive what is known as Death Duty: the average life expectancy for a recruit is four months…in some cases, much less! Dissidents in the Terran Empire are put on the infamous List – tracked down by Death Duty squads and terminated for their rebellion with extreme prejudice. A termination mission could take place anywhere – on alien worlds, Martian cities or aboard a rebel spaceship or station. Described by some as ruthless assassins working with the worst of intentions, Dutymen – and women – see themselves as simply being paid to kill to keep the Empire safe. For most of them, exactly who they kill doesn’t matter – until one of their number, Travis Wilson, begins to question the missions they’re assigned and goes AWOL… a wanted man.